Hokkaido is considered Japan's wild frontier. This northern island is known for wildlife, volcanoes, pristine lakes, vast forests, fields of flowers and of course Japan's ubiquitous hot springs (onsens). We'll cycle on smooth roads, over the highest paved mountain pass in Hokkaido – Mikuni Toge at 1139 m, ride around many lakes, including one of the clearest in the world, and along coastal roads. We'll stop to smell the flowers, especially at the Wakka Wild Flower Park with more than 300 kinds of wild flowers present, as we have timed our tour to see them in bloom. And we'll head into the wilds of Shiretoko National Park which is home to Japan's largest population of brown bears. Hokkaido's coastal waters boast some of the best and freshest seafood, including crab, scallop, sea urchin, squid, cod, salmon, shrimp, abalone, surf clam, salmon roe, herring, and kelp. Eating local is a highlight of our tours, and this seafood bonanza is no exception. And no tour to Japan would be complete without onsens to soak in after a day in the saddle, and there will be plenty of opportunity to do so on this ride. Arrive at Sapporo, Japan's second largest island and our starting point to explore Hokkaido. Board a train to the town of Furano, known for lavender and its explosion of colour from fields of flowers. Start cycling through flat fields and follow a river upstream on a gradually ascending road to the Karikachi mountain pass at 644 m.
We cycle across the Tokachi plain and start the climb to Shirakaba Pass at 900 m. Enjoy a short downhill to the highest lake in Hokkaido and over-night in the town of Nukabira and its town onsen. Today is a challenging day as we conquer the highest mountain pass in Hokkaido, the Mikuni Toge at 1,139 m. We have a 10-km warm up before we start climbing to the summit and overnight in the famous Shiobetsu Onsen. Today is an easy day as we cycle downhill to Lake Saroma, the third larg-est lake in Japan. Enjoy the fresh taste of oysters and scallops from the lake for dinner. We cycle to Wakka Wild Flower Park with over 300 kinds of wild flowers. After our visit, we continue along a path which used to be a railroad track to Cape Notoro. A free day to explore museums and shopping areas of Abashiri. We head south and cycle along the second largest lake in Hokkaido and one of the three lakes in the Akan National Park. We ride to the active volcano Lozan, also called Sulphur Mountain. We then continue on a long gradual uphill to an outlook over Lake Mashuko, known to be one of the clearest lakes in the world. 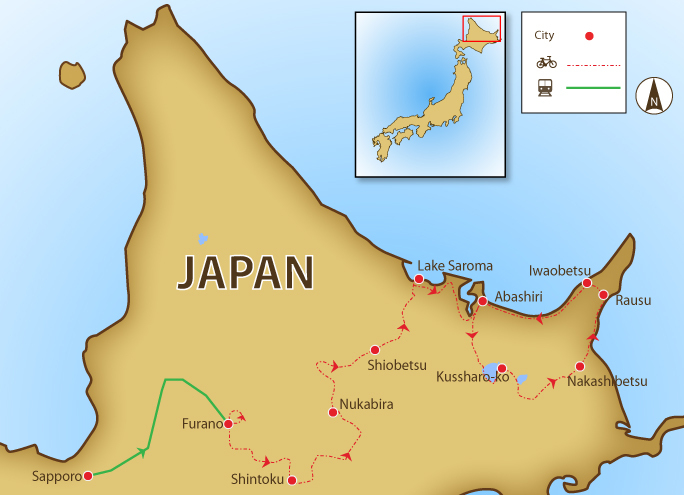 This morning we ride to Shiretoko Peninsula, a UNESCO World Heritage Site. Continue cycling along the shore to a fishing village famous for its king crab and finish our day off with a local onsen! Today we start with a 16 km climb with spectacular views of Mt. Rausu, the highest peak in the Shiretoko Mountain Range. After a leisurely downhill, we visit Shiretoko National Park, largest home to Japan's brown bear. We head on a long, straight road for a brief stop at Koshimizu Wild Flower Reserve and finish our ride in Abashiri on a hillside hotel overlooking the lake. You can transfer to Memanbetsu Airport or Abashiri Train Station for your onward travel. Day 3 - Furano - Shintoku Ride 82km. +776m / -765m. Our cycle tour of Hokkaido is moderately challenging with a few mountain passes to conquer and some long distances when on flatter terrain. We ride a total of 830 km in 11 cycling days and ascend a total of 8729 m on quiet roads with amazing views. There is an option on Day 11 to ride an additional 48 km. You have the option to use a hybrid or a road bike as both are appropriate for this tour. On two nights, we will be overnighting at hostels, and though the rooms will be private, the facilities will be shared. All meals are included, except for lunch and dinner on the rest day. We will be enjoying traditional Japanese fare for our meals, including local seafood. Suitability: This is a tour for cyclists possessing a moderate to high level of physical fitness. Fitness will be a huge asset on those long-distance days and on the ascents in the hills. We have climbs nearly every day, but we also have some rollicking descents to enjoy, and fit cyclists will have no problems. The tour is fully supported, so the bus is always close at hand for those finding any part of the riding too difficult. Biking Conditions: This trip is along tarmac roads in good condition, and there is no technical riding. The climbs are gradual on easy gradients of 5%. In 11 days of cycling, we ascend a total of just over 8729 m.
Known for hosting the 1972 Winter Olympics and its famous Snow Festival, well-connected Sapporo is our starting point to explore Hokkaido. We meet at the hotel where we will have a trip briefing. This morning, we board a train to the town of Furano, known for lavender in the summer and skiing in the winter. The three-hour train ride will be a good opportunity to take in the Hokkaido landscape, especially the explosion of colour from flowers fields. Upon arrival, we transfer to our hotel, and then it's time to meet your bike for an afternoon ride to the surrounding hills. Leaving Furano town, we cycle through flat fields and into the mountains, following a river upstream. We come across the beautiful Lake Kanayama nestled in the mountains and keep cycling along the shore. We stop for lunch at the far end of the lake, as we need to fuel up for our afternoon climb up to our first mountain pass. Karikachi Toge tops out at 644 m, and from the viewpoint, we'll have magnificent views of the Tokachi Plain. Tonight's accommodation has a natural hot spring (onsen), and we can relax in the waters and rest our legs from the climb. We cycle through the Tokachi Plain in the morning and stop for a break before we start this morning's climb. On the way to Shirakaba Toje (900 m), we cycle through farmland and forests. We enjoy a short downhill to Lake Shikaribetsu, which, at 800 m, is Hokkaido’s highest lake. We have a picnic lunch lakeside and then continue along the shore on a narrow winding road where we take in the contrast of the green forest leaves against the cobalt blue lake. We overnight at the town of Nukabira and check into our hostel that has a natural outdoor onsen for us to enjoy. We will have private rooms, but the facilities will be shared. Today’s challenge is conquering the highest paved mountain pass in Hokkaido – Mikuni Toge at 1,139 m. Starting from Lake Nukabira, we have a gentle start before the true climb begins 10 km before the summit. 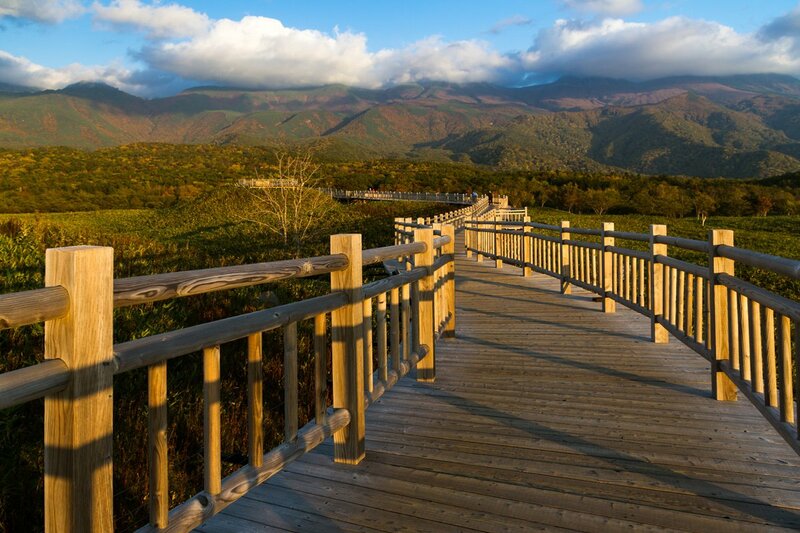 On the way, we have fantastic views of the Kumaneshiri mountain range and dense woodlands. After a morning tea at the top of the pass, we cycle down to Lake Taisetsu and start our second climb of the day, up to Sekihoku Pass at 1,040 m. A picnic lunch at the summit is your reward before we have a 30 km downhill to our accommodation. Tonight, we have another opportunity to soak ourselves, this time in the famous Shiobetsu outdoor hot spring, known for its silky-smooth water. This is a recovery ride after those mountain passes, and most of the route is a gradual downhill to Lake Saroma, though there is one small climb. We have a morning break at a park in Rubeshibe and then have an undulating cycle through farmland and small hills. We finish at our accommodation by Lake Saroma, the third largest lake in Japan and the largest in Hokkaido. It is known for various kinds of aquaculture – oysters, scallops, shrimps – and we can taste fresh oysters and scallops from the lake at dinner. As we cycle along the lake this morning, we'll likely see fishermen farm-ing scallops. The highlight of today is the Wakka Wild Flower Park, which blooms more than 300 kinds of wild flowers, such as the Siberian Lily, the Rosa Rugosa, the orange-yellow Day Lily. The unique flower garden is 25-km long and runs between Lake Saroma and the Sea of Okhotsk. After our visit, we continue on a designated cycling path that used to be a railroad track as we head to Cape Notoro. The cape is known as the best place to see ice drifts floating from Siberia in the winter. We'll enjoy magnificent views of Sea of Okhotsk from the cape before riding on to Abashiri and our city centre hotel. A day to rest or to explore Abashiri. There is shopping and museums within an easy walking or cycling distance. Recommended is the Hokkaido Museum of Northern Peoples, which introduces the culture and traditional everyday life of the inhabitants of the northern, subarctic regions, including the Ainu of Hokkaido, the First Nations people of northern Canada, the Inuit, the Sami, and Siberians. Lunch and dinner are on your own, and there are many places to choose from. From Abashiri, we head south to a beautiful caldera, Lake Kussharo-Ko via Bihoro Pass, which looks over the lake and surrounding mountains. At the top of the pass, we have lunch at a rest house and then enjoy riding downhill to the shore of Lake Kussharo-Ko. It is the second largest lake in Hokkaido and one of three lakes in Akan National Park. The area is known for its abundant hot springs from volcanic activities. We have a brief stop at sunayu, a popular foot spa site on the shores of Lake Kussharo-Ko before we retire to our lakeside retreat. We continue cycling along Lake Kussharo-Ko, and we will know when we are close to the active volcano Lozan, which literally means “Sulphur Mountain.” Lozan last erupted liquid sulphur in 1889 and 1936, but it is still steaming and reeking of sulphur. After a gradual, but long up-hill, we reach the lookout of Lake Mashu-Ko, with waters known to have the highest level of clarity in the world. The 200-m high cliffs surrounding Mashu-Ko prevents people from going down to the lake shore, which many believe is what helps protect the water quality. Most of the time, the lake is covered in fog, but if we are lucky, we will be able to view the emerald-coloured surface. The rest of our cycling day is easy, mainly downhill with flat runs into the farming area of Nakashibetsu. This morning we ride through dairy farms, enjoying the changing scenery as we approach Shiretoko Peninsula, dotted with volcanoes. It became a UNESCO World Heritage Site in 2005 for being the southern-most point where sea ice forms in the Northern Hemisphere. We cycle along the east coast of the peninsula, heading to our day’s destination, the small fishing village of Rausu, famous for its sea kelp and king crab. In the afternoon, you have an option to ride or drive a further 24 km along the coast to the Aidomari Onsen, used as a public bath for local fisherman and has a perfect seaside setting. At dinner, enjoy local fresh seafood. From Rausu, we cross to the other side of the peninsula, requiring us to climb 16 km between two mountains. It is a gradual climb with spectacular views of Mt Rausu, the highest peak in the Shiretoko Mountain Range. After a leisurely downhill, we lunch at the Shiretoko Nature Centre, where we learn it is home to Japan's largest brown bear population. We make a side trip to Iwaobetsu Onsen, where trees surround the natural rock pools. By mid-afternoon, we cycle towards Iwaobetsu Hostel, the only accommodation in Shiretoko National Park. We have a salmon dinner in the hostel, where the chef cuts whole salmon into pieces for sushi and BBQ. We continue riding along the coast and enter fields of hay, oats, and beans. The long, straight roads travel also through potato farms, which will be in full bloom in early July. We have a brief stop at Koshimizu Wild Flower Reserve, where about 40 kinds of flowers bloom in spring and summer. We finish our ride back in Abashiri; however, we stay at a different hotel, this time on the hillside overlooking Lake Abashiri. One last outdoor onsen awaits, this time with a spectacular lake view. We will transfer you to Memanbetsu Airport or Abashiri Train Station for your onward travel. Because some people can't imagine going on a trip without their own beloved bicycle, we do not provide them as part of this tour. However, you can hire bikes locally for the price listed in the tour pricing section. You can choose to rent a hybrid TREK 7.3FX or a TREK 1.2 road bike. Both models have lightweight alloy frames, 24- to 27-speed gearing, v-brakes, and Shimano components. If you bring your own bike, please make sure that it is a hybrid or road bike and that it is in good mechanical order.